40 Vegetarian Meal Prep Recipes—Breakfasts, Lunches, Dinners & Snacks! Check out these 10 vegetarian breakfasts, 10 lunches, 10 dinners, and 10 snacks to see what you like. Then, you can mix and match to create TONS of new vegetarian meal prep combinations! Variety in your meal prep will keep healthy food interesting! All of these recipes are meatless, and the majority are also plant-based for anyone living a vegan lifestyle. Plus, many of these vegetarian meal prep recipes are also gluten-free and dairy-free! Healthy food doesn’t have to get boring. And, even the simplest of recipes can be amazingly delicious. Some of the vegetarian meal prep recipes in this list only use two or three ingredients! That’s because these recipes are made with real, whole foods that provide our bodies with the kind of fuel it appreciates. 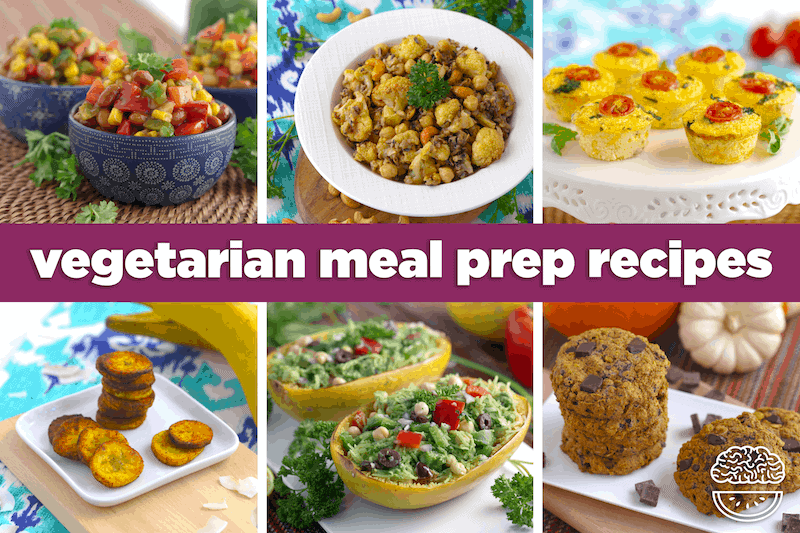 And, it makes prep time a whole lot easier… Feel free to get creative with different ingredients and flavorings to make these vegetarian meal prep recipes your own! 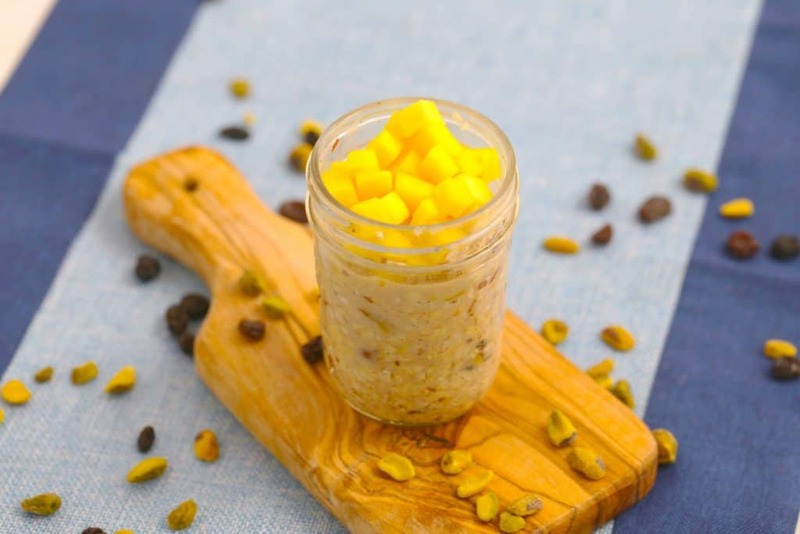 Not an overnight oats fan? 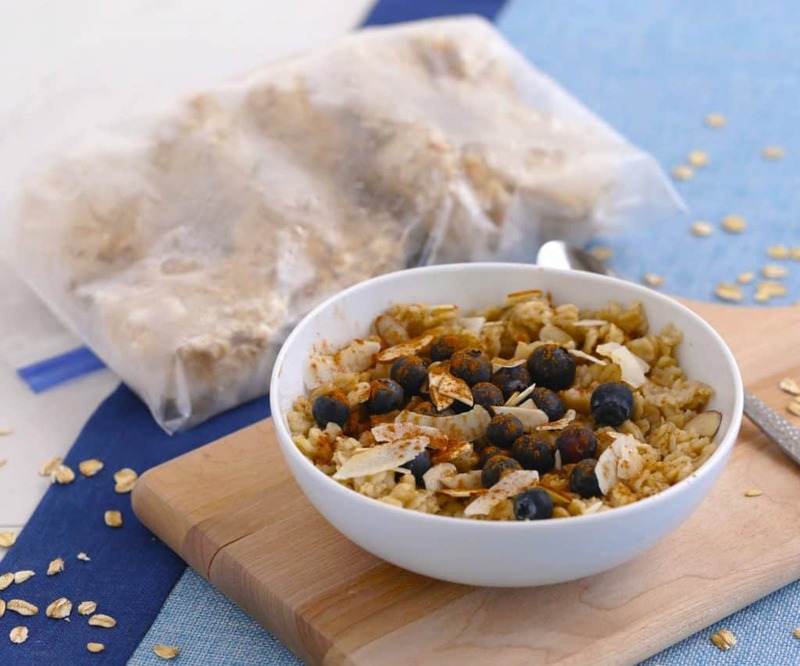 Meal-prep your HOT oatmeal by portioning and freezing it into muffin tins! And, when you cook your batch of oatmeal, you can flavor and sweeten it however you like. In the mornings, simply reheat a few of the oatmeal cups on the stove, or in the microwave. Then, stir in whichever fresh fruit, nuts, or toppings that you like and enjoy! With so many possible toppings and mix-ins, you’ll never have a boring breakfast! *Use flax egg for vegan & dairy-free chocolate chips or cacao nibs. **Use certified gluten-free oats for gluten-free. Cookies for breakfast?! You better believe it! These beauties are deliciously sweet but full of wholesome fuel—with NO refined flours or added sugars! 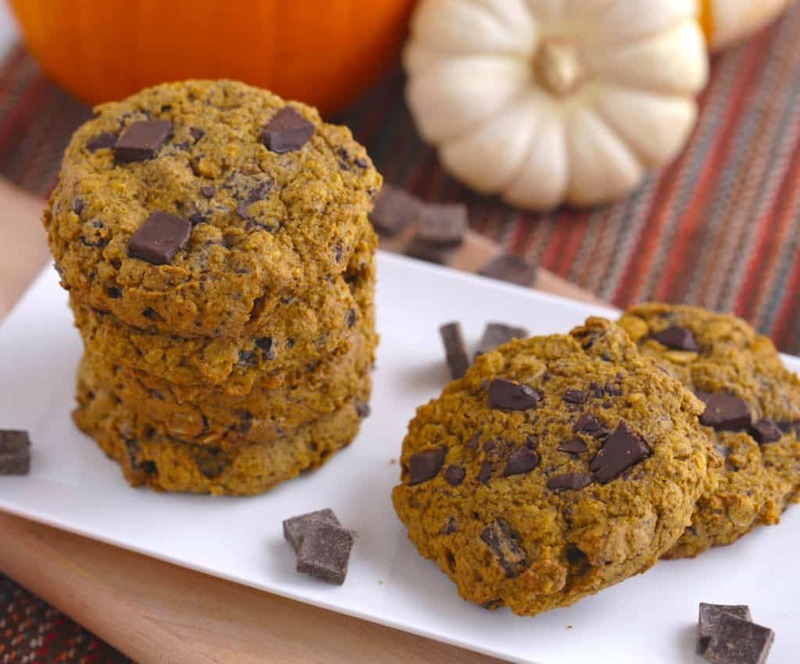 The pumpkin puree gives these cookies a bit of natural sweetness, but YOU are in control of the kind and amount of sweetener you add. And, using oats and oat flour keeps this meal prep breakfast whole-grain and gluten-free. Also, you can make this a vegan breakfast by using a flax egg and dairy-free chocolate chips or cacao nibs! Pie crust is delicious—no doubt about it. But, it’s made from refined flours which don’t offer much fuel for our bodies. Instead, you can bake your quiche right into the pie pan! This recipe has a fluffy texture, but is still sturdy enough to cut into slices. And, each slice has over 1 serving of vegetables in it! Getting your veggies in has never been easier. It can often be tough to find low carb vegetarian meal prep recipes. 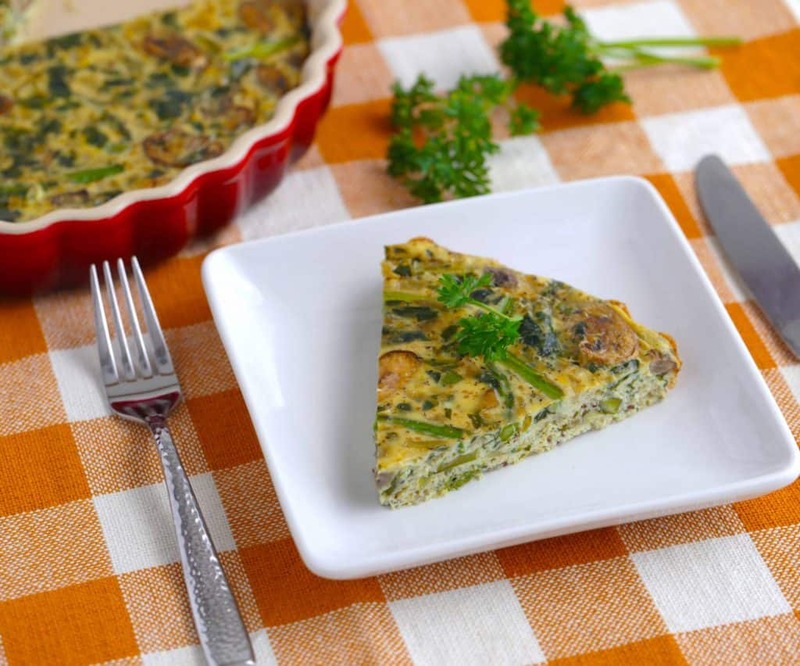 But, this tasty quiche has only 5 grams of net carbs per serving! *Use non-dairy milk of choice. When it comes to vegetarian meal prep recipes, smoothies are a deliciously simple choice for a quick breakfast. Plus, there are endless flavor combinations you can explore! These 5 smoothie recipes all contain healthy superfoods that are loaded with antioxidants and anti-inflammatory benefits. 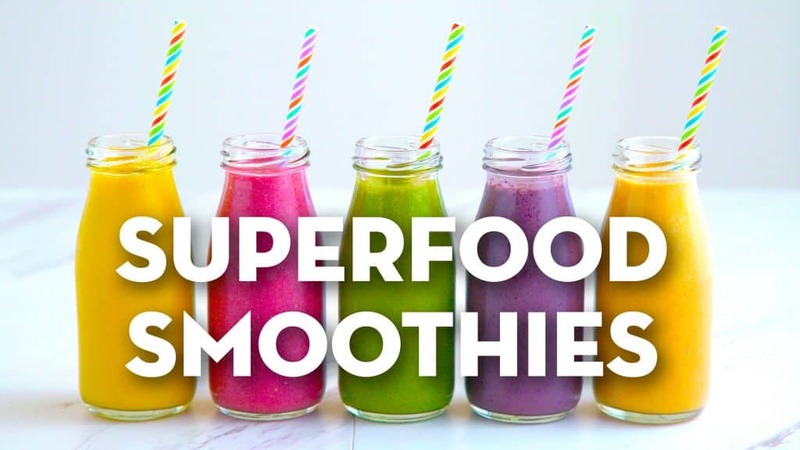 Which superfood smoothie suits your style?! What do you get when you cross a a cheesy egg breakfast with a fresh lunchtime salad? These savory brunch bites! 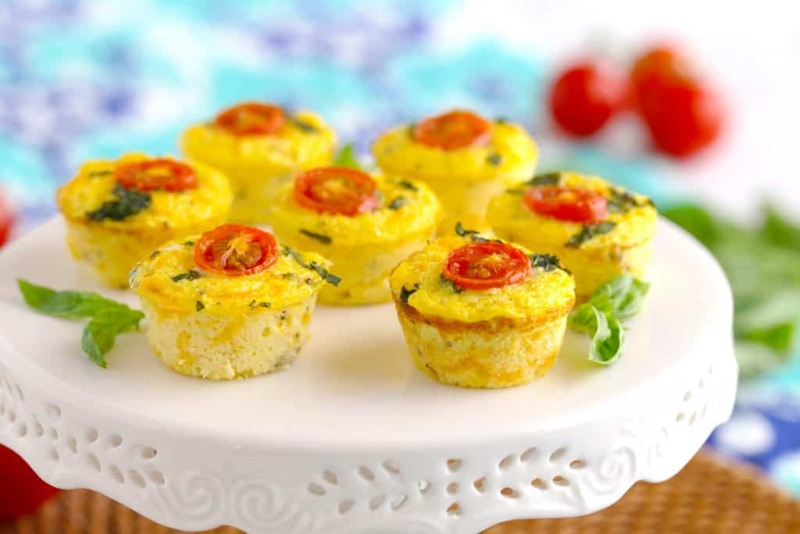 Just mix together your ingredients, add your toppings, and bake in mini muffin tins. They’re like teeny crust-less quiches! And, you’d never guess that 1 serving of these mini muffins has an entire serving of CAULIFLOWER hidden inside! It adds some creaminess and thickness, plus tons of fiber and essential vitamins! Here’s an easy meal prep breakfast that tastes like a sweet DESSERT—a.k.a. “mithai” in Indian cuisine! If you’re sick of your same-old-same-old overnight oats routine, this flavor combo is the perfect way to switch things up. They’re sweet, creamy, and loaded with slow-digesting carbs to fuel you throughout the day! Plus, the pistachios and almonds add some satiating protein and a satisfying crunch. Make this your own with you favorite fruits and mix-ins. Or, add some protein powder! If you’re looking for on-the-go vegetarian meal prep recipes, this LOW-CARB pumpkin bread is the perfect option! Just blend up your batter ingredients, bake, and you’ve got a healthy breakfast to last you all week. It’s a simple meal that you can have ready to grab and go on busy mornings. Plus, this fuel-filled breakfast uses no refined flours, and is completely sugar-free! 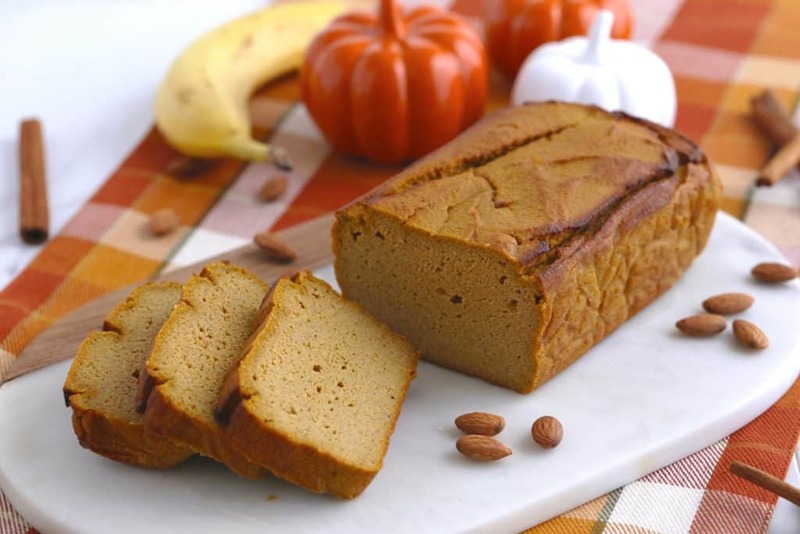 Almond flour keeps this pumpkin bread low in carbs and high in fiber. And, you can make this a Paleo breakfast by using an approved sweetener. Quinoa doesn’t have to be savory ALL of the time—it adds delicious texture and nutrition to this sweet, simple breakfast! 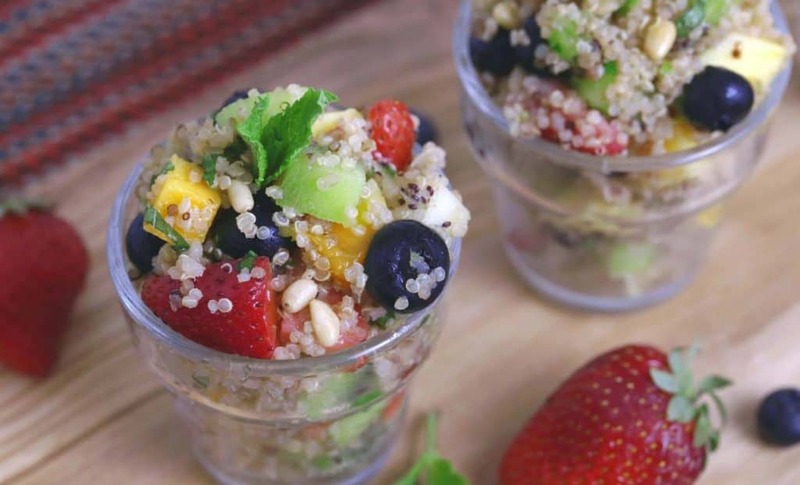 Quinoa is a wholesome, gluten-free grain that can bulk up a fruit salad and keep you energized throughout the day. Plus, this superfood grain is also high in protein and fiber! 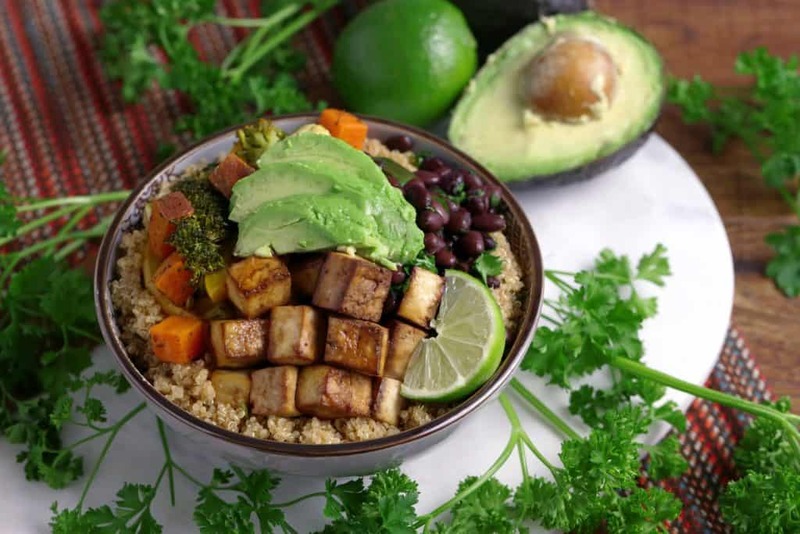 You can prep a large batch of quinoa and chop your fruits at the beginning of the week, making this one of the simplest vegetarian meal prep recipes on our list. Sometimes the simplest vegetarian meal prep recipes are the most delicious. And you only need 3 INGREDIENTS to make this healthy breakfast! 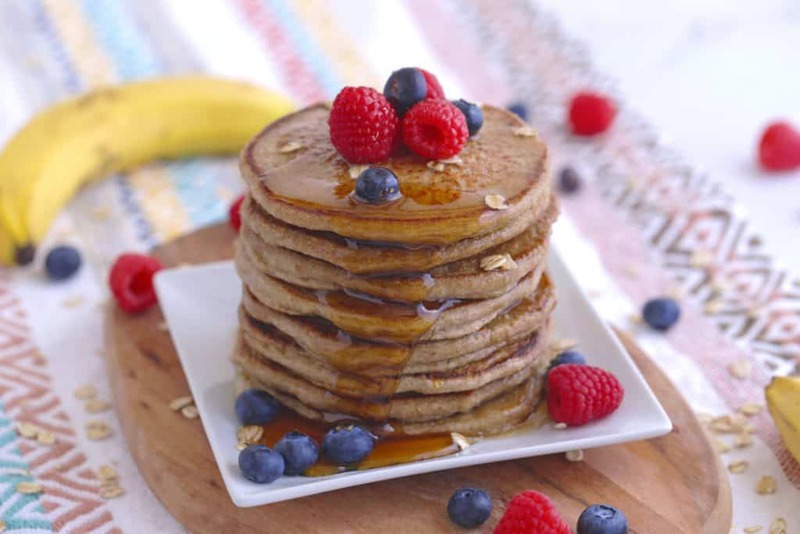 These vegan pancakes are light, fluffy, and naturally sweet with NO added sugars—thanks to the bananas. Just be sure to use ripe, spotted bananas for maximum sweetness! Top with a generous drizzle of maple syrup and your favorite fresh fruit. **Substitute nut butter with sunflower seed butter. 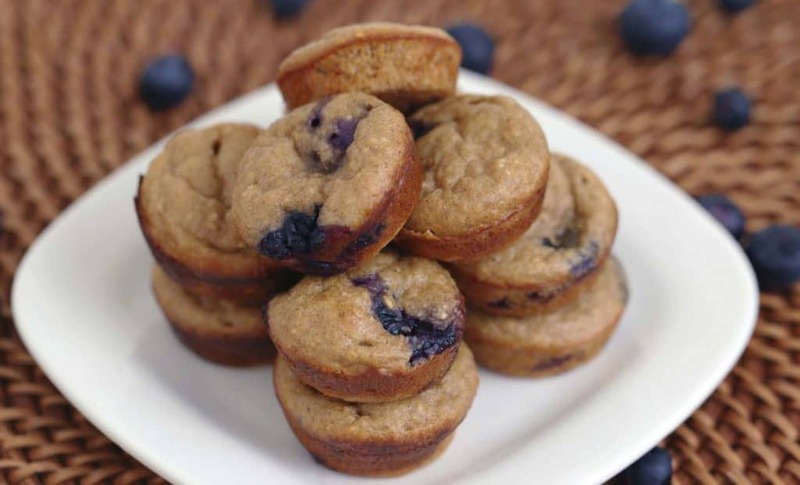 These mini muffins are SO easy to make—just blend up your batter, add blueberries, and bake! 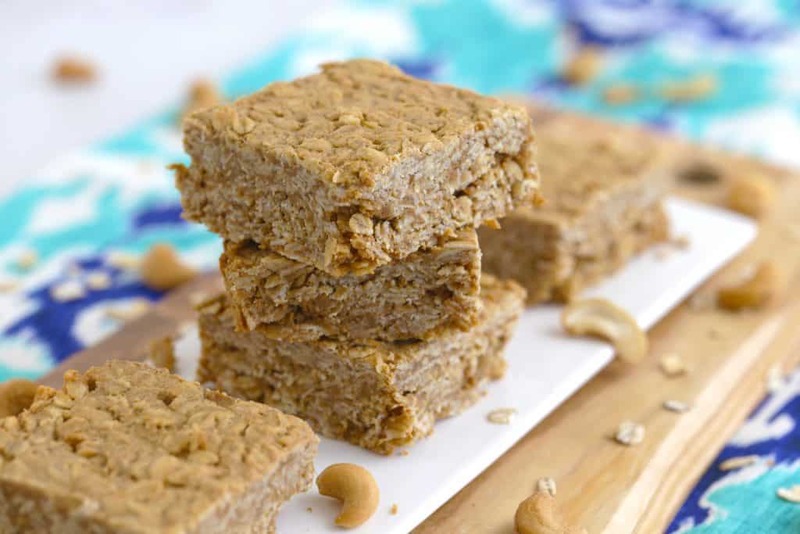 Made with oats instead of refined flour, they’re whole-grain, fuel-filled, and gluten-free. Plus, the ripe bananas add a natural sweetness, so you may not even need to add any sweetener! It’s a delicious on-the-go breakfast, or a simple snack. If you bake these into mini muffin tins, each mini muffin is only about 20 calories! *Substitute ghee for coconut oil. 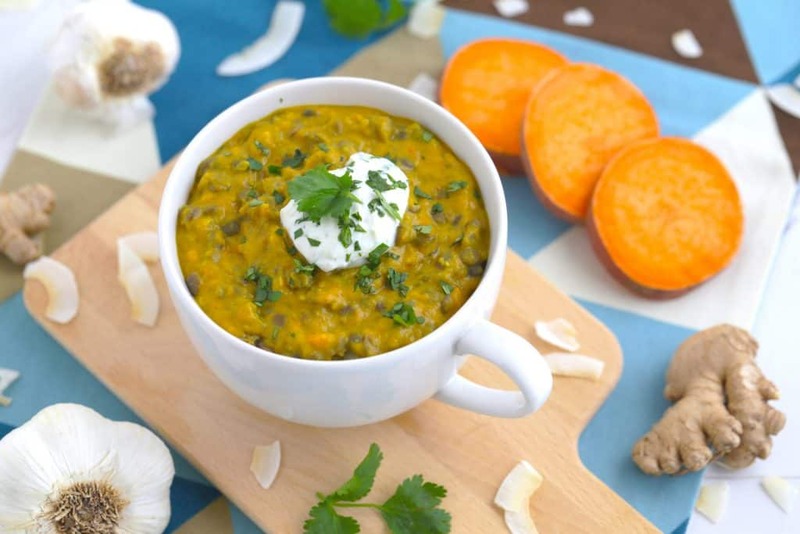 Pack some plant-based protein into your lunch with this lusciously creamy soup! The coconut milk makes this soup satisfyingly thick and adds a dose of healthy, fuel-filled fat. And, it helps to balance the kick of zesty ginger and cayenne. Cooking the veggies in ghee makes gives them a crave-able savory flavor that you’ll want to enjoy over and over. But, you could use coconut oil or any other oil to make this a vegan meal prep lunch! Cauliflower is one of the most nutritious vegetables on the planet, full of fiber and cancer-fighting sulforaphane! 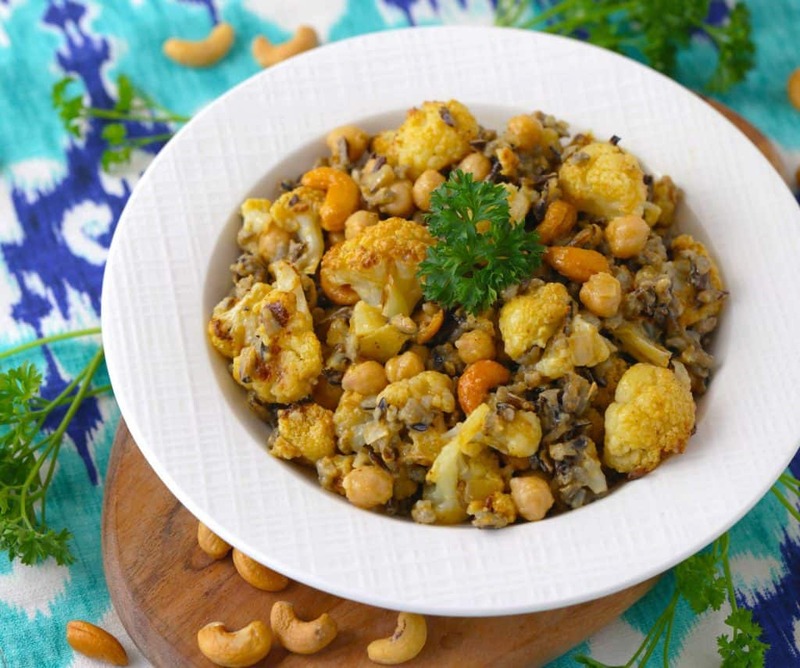 But, it can get a little boring after awhile… Take your cauliflower to the next level with this savory-sweet curried dressing! Plus, with the protein-packed chickpeas in this bowl, it’s a healthy meal prep lunch that will fill you up and keep you satisfied. 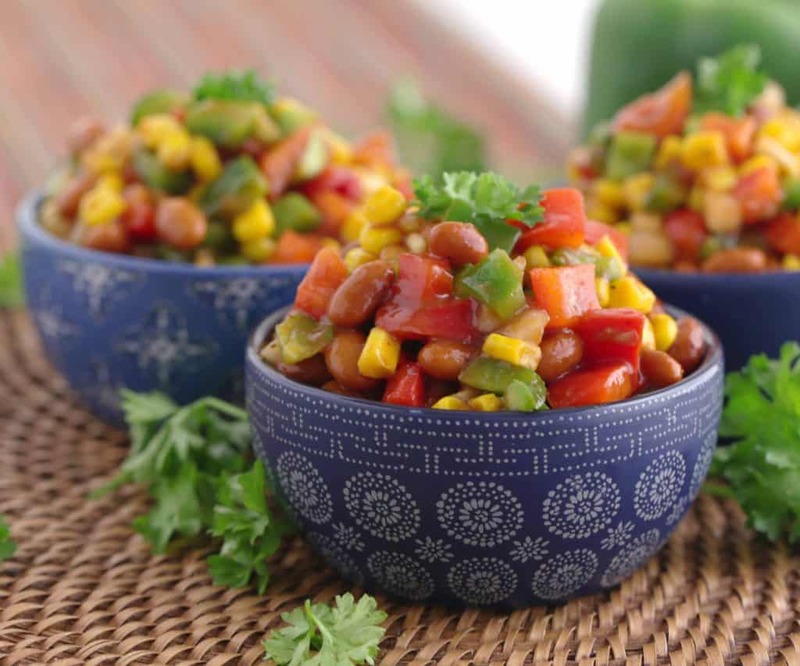 Ditch the bland salad leaves and spice things up with this BBQ bean salad! The kidney beans are a great source of protein, fiber, and magnesium, which is an essential mineral that can help regulate our sleep cycle. And, drenched in your favorite BBQ sauce, it’s a savory-sweet meal that never gets old. Plus, canned beans and veggies keeps this a SUPER affordable meal prep lunch! Of course, feel free to switch things up and use your favorite veggies. There are TONS of vegetarian meal prep recipes out there, but how many will you actually try? Make things easier on yourself with this ONE PAN meal! Coating your tofu in hummus and then baking it makes for a deliciously crispy and zesty lunch. And, paired with roasted veggies, it’s a balanced meal that’s painless to prep. Plus, you can enjoy the combo in any number of ways—stuffed into tacos, as a burrito bowl, or however you like! *Use gluten-free pasta or quinoa, and quick oats instead of breadcrumbs. When it comes to mac & cheese, how can you NOT go overboard?! 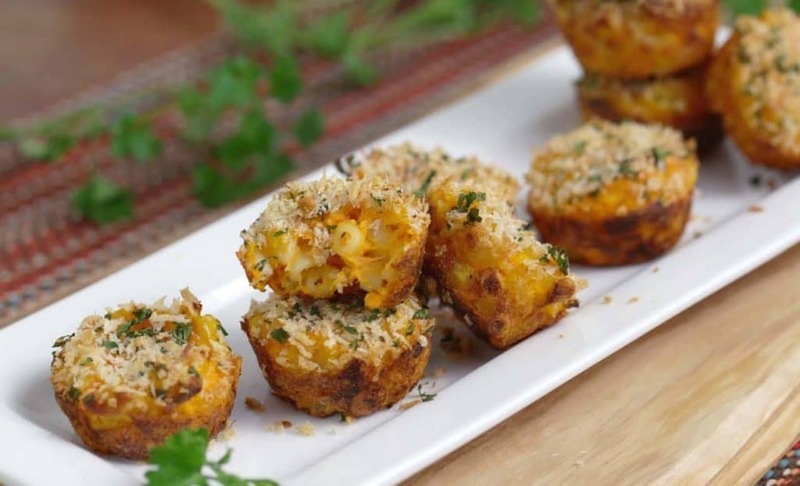 Luckily, you can bake your mac into mini muffin tins—the perfect form of portion control! The breadcrumbs make these beauties crispy on the outside and lusciously cheesy on the inside. But, you can also make this a gluten free meal prep lunch with gluten-free pasta, and use oats as breadcrumbs. Best of all, each cheesy mac bite is chock-full of wholesome veggies like cauliflower, carrots, and butternut squash! 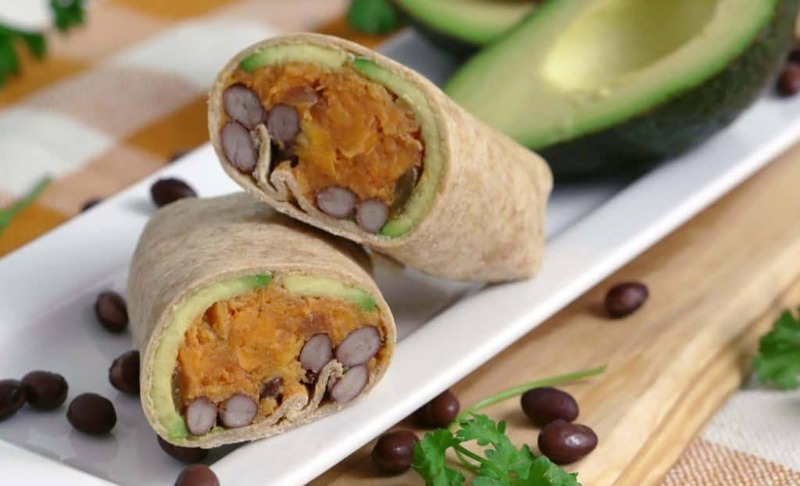 Skip the standard greasy burrito and try this vegan burrito that’s packed with wholesome veggies! The sweet potato pairs perfectly with the black beans for a creamy, fiber-filled lunch. And, the avocado adds healthy monounsaturated fats to help keep you full! Seriously, every bite of this burrito is better than the last. Plus, you can make this a gluten free lunch with a gluten free tortilla! 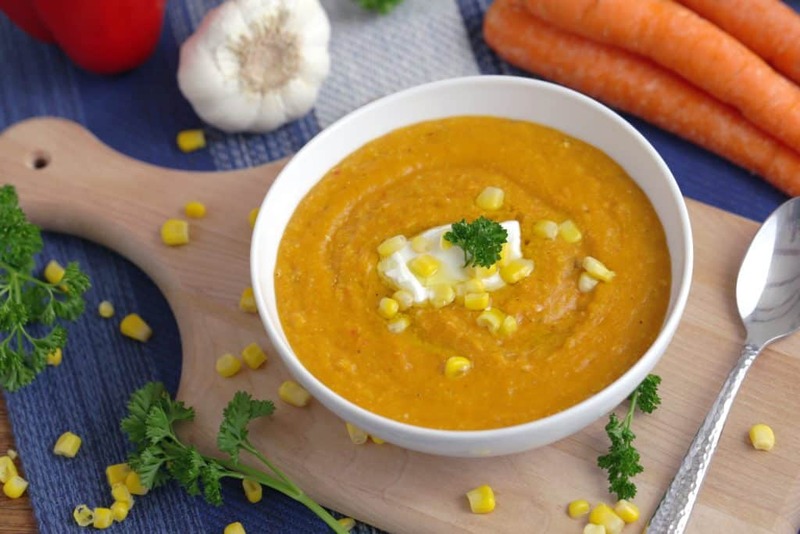 Vegetable soups are go-to vegetarian meal prep recipes for me because they’re so EASY! This chowder is full of yummy flavors like garlic, thyme, and paprika. Plus, there’s a hint of sweetness from the corn and coconut milk! In combination, the coconut milk and potato make this chowder SO thick and satisfying. And, you can make a big batch to freeze so you always have a healthy meal ready! Vegetarian meatballs?! Sounds like an oxymoron, right? 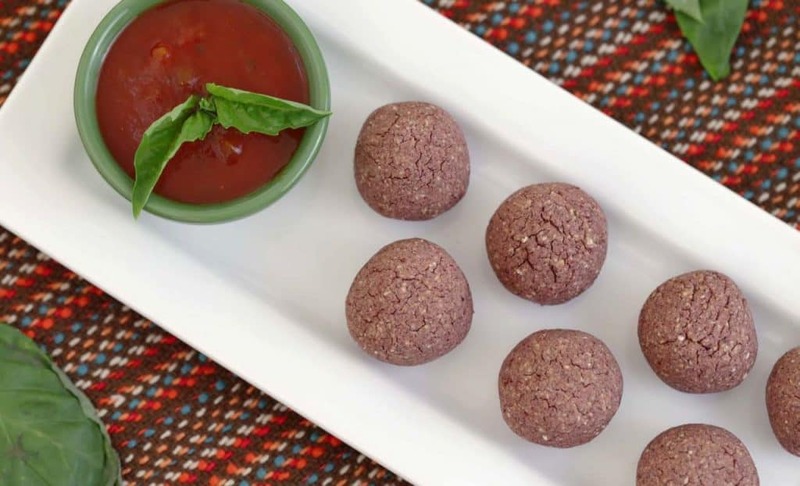 Well, these meatless ‘meatballs’ make the impossible possible! Just like real meatballs, they’re hearty, satisfying, and packed with protein. But, that protein comes from nutritious BEANS instead of meat! Enjoy them dipped in marinara, or on top of your favorite pasta! 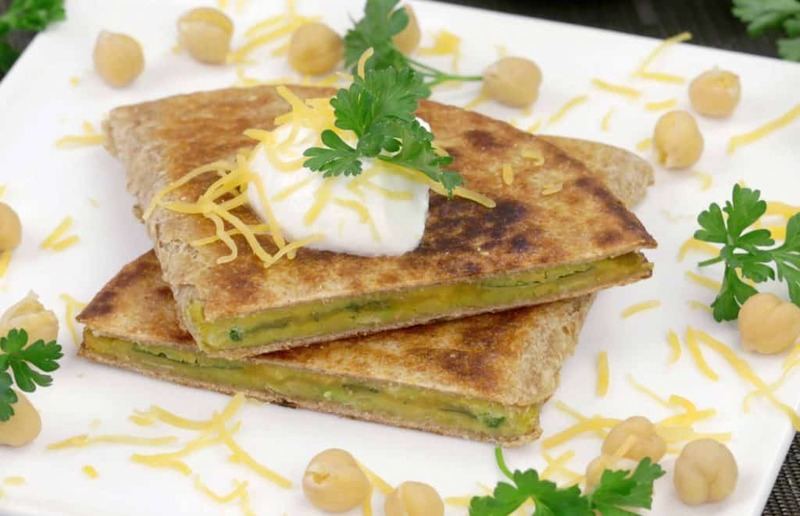 If you’re looking for budget-friendly vegetarian meal prep recipes, this quesadilla is a winner. One serving of this meal costs less than $1 to make! Mashed chickpeas and avocado make this vegetarian lunch irresistibly creamy. Plus, they add loads of fiber to keep you full throughout the day! And, you can even sneak some vitamin-rich kale into your diet. But, if you’re not a fan of kale, don’t worry—you won’t even taste it between all the creamy layers! And, contrary to popular belief, you CAN pack a quesadilla for lunch. It’s delicious warm or cold! Black bean burgers can be just as hearty and finger-lickin’-good as any beef burger! And, these are so simple to make—just make your dough, form into patties, and bake. These veggie burgers actually hold together really well, so go ahead and load them up with all the fix-ins. 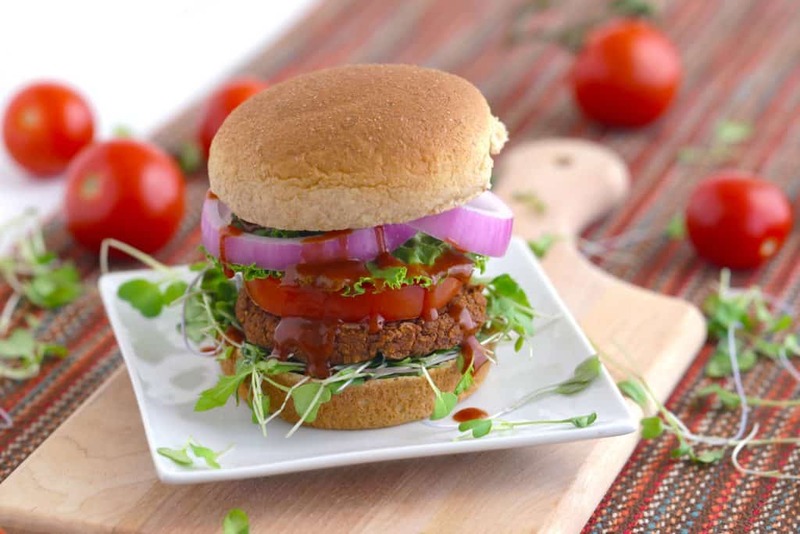 But, instead of eggs, this recipe uses oats as a binder, making these VEGAN veggie burgers! Plus, you can prep a batch of patties and freeze them for up to 3 months. You can’t beat 3-ingredient vegetarian meal prep recipes! Simplify dinnertime with this easy slow cooker recipe! Protein-packed tofu is a staple in vegetarian meal prep recipes, but sometimes it’s just…bland. Jazz things up with some zesty Buffalo sauce and ranch seasoning! Then, cook it slow and low, letting those flavors infuse into the tofu. Enjoy it on its own, on top of your favorite grain, or however you like! But, I personally recommend baking some sweet potatoes and stuffing them with your buffalo tofu. Sweet potato complements the kick of Buffalo flavor perfectly! *Use certified gluten-free oats for gluten-free. 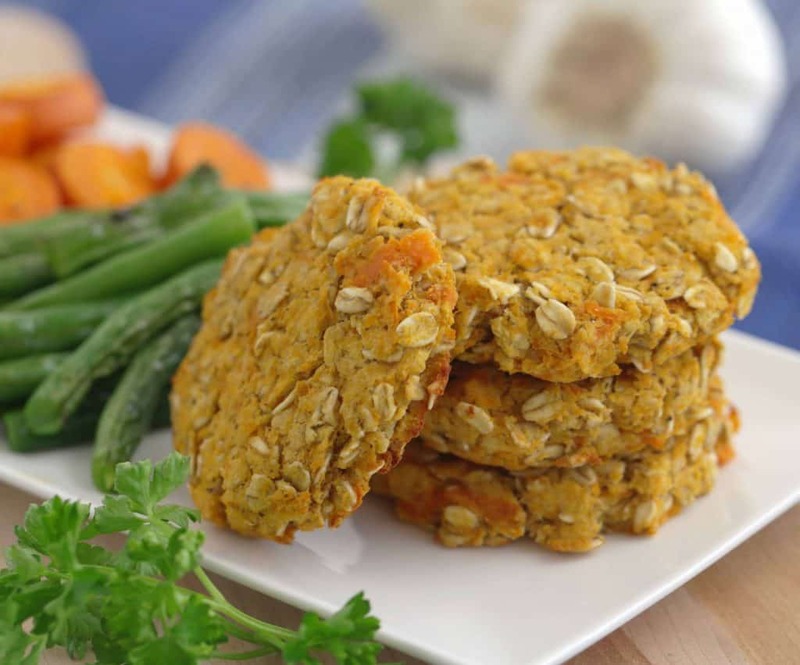 These lentil patties are a cinch to make, but they’re SO tasty. And, they’re surprisingly filling, thanks to the plant-based protein and fiber in the lentils. The sweet potato packs in even MORE fiber, along with healthy antioxidants like beta-carotene. Plus, their creaminess and natural sweetness will keep you coming back for more. Luckily, you can eat FIVE patties in just one serving of this easy meal prep lunch! And, for anyone searching for budget vegetarian meal prep recipes, this meal costs less than $2 per serving! A slow cooker is a meal-prepper’s best friend. 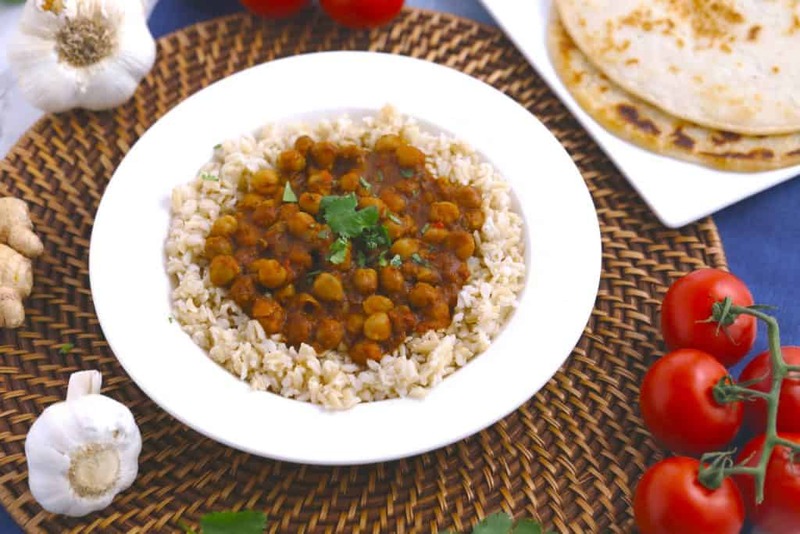 You can create rich, deep flavors with minimal effort, like in this chana masala! If you haven’t tried chana masala, it’s an Indian dish with all sorts of variations. Here, it’s pretty much a savory, scrumptious chickpea dish! The chickpeas soak in the zesty kick of fresh ginger and chili peppers for a dinner that’s anything but boring. And, chickpeas are an awesome source of plant-based protein, fiber, and essential minerals. Serve on top of brown basmati rice, with naan, or enjoy it on its own! 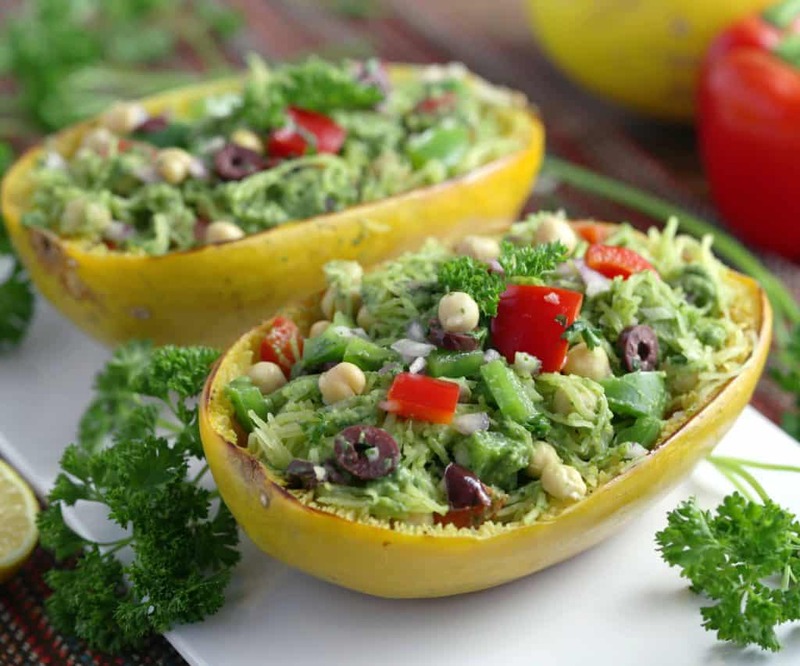 Spaghetti squash is a nutritious and versatile base that you can use in all kinds of vegetarian meal prep recipes. Here, it’s topped with a savory Mediterranean salad, full of fresh veggies and chickpeas! And, tossing everything together with a luscious pesto adds tons of flavor to the dish. If you’re vegan or living a dairy-free lifestyle, check out my low-fat VEGAN pesto recipe! Plus, I think this spaghetti squash boat is even more delicious served cold. Perfect for meal prepping, or even packing as an on-the-go lunch! Here’s a VEGAN meal prep dinner that’s as easy as one, two, soup! Yes, this nutritious vegetable soup only requires TWO main ingredients: broccoli and beans! The beans make the soup creamy, thick, and protein-packed, and broccoli adds its fair share of protein, too. 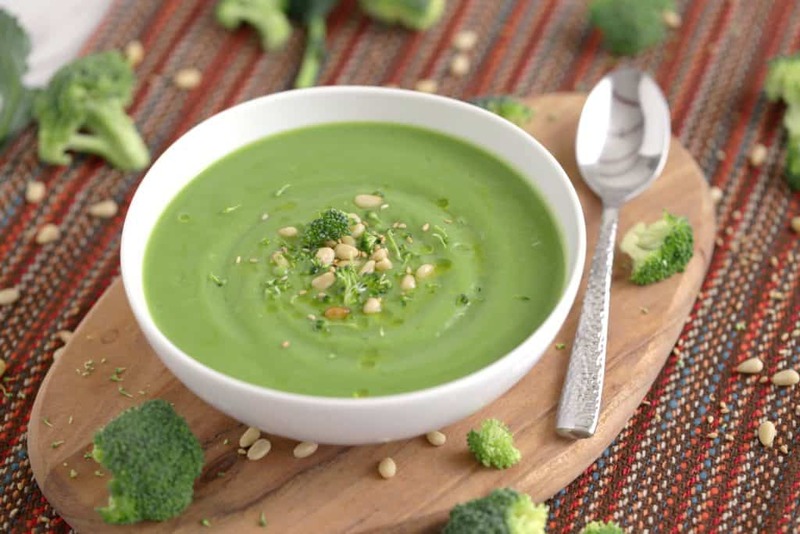 Probably the easiest soup ever, and a tasty way to get your dose of cancer-fighting broccoli. But, feel free to jazz it up with other veggies that you like! Best of all, this soup is made for meal prep. Whip up a big batch, portion into airtight containers, and freeze! *Use corn tortillas or gluten-free tortillas. Skip the skillet and toss your fajita mix into the slow cooker! The combination of black beans and TONS of antioxidant-rich bell peppers make this dinner deliciously nutritious. And, it’s got plenty of plant-based protein and fiber to satisfy your appetite! But, there are also loads of other fajita mix-ins you can experiment with. 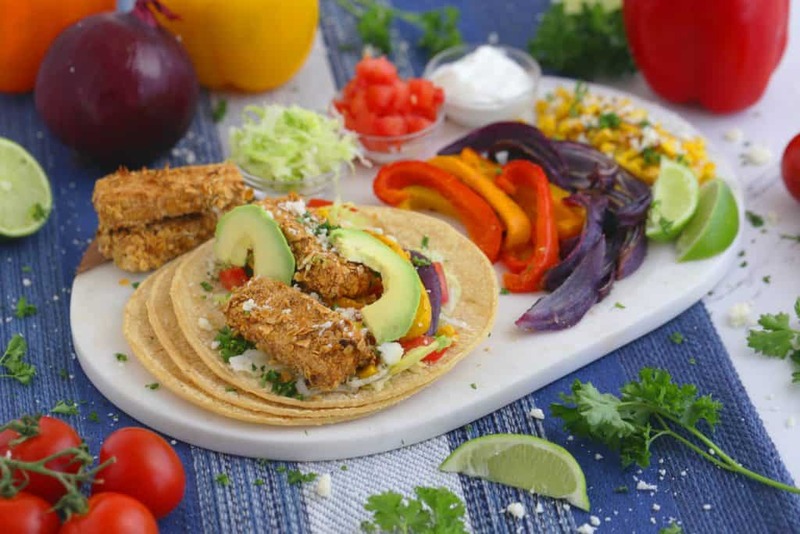 Serve on corn tortillas for an authentic (and gluten-free!) 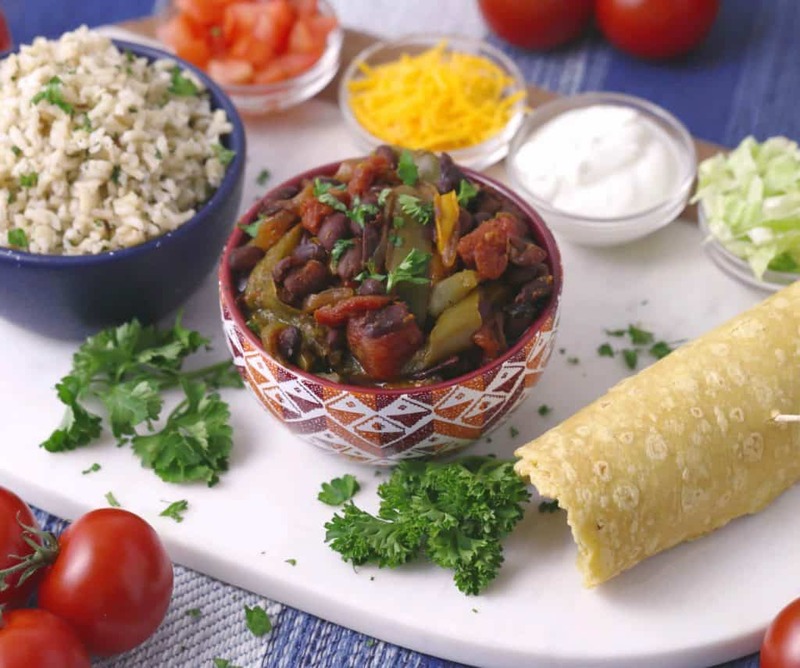 fajita experience, or enjoy the bean and veggie mixture on its own. And, you can toss all of these ingredients into a freezer-safe bag to freeze so you always have a healthy meal prepared! *Substitute farro with quinoa (or another gluten-free grain). Frozen dinners can be quick and convenient, but they’re generally loaded with sodium and all sorts of additives. 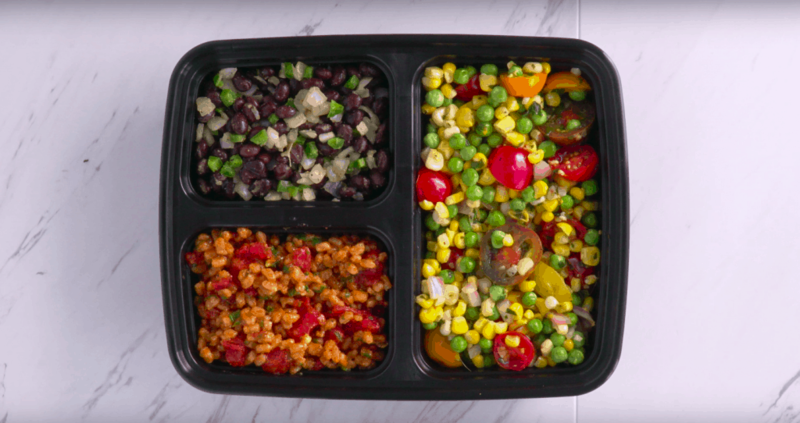 Instead, make your own HOMEMADE freezer meal with these 3 vegetarian meal prep recipes! The corn, pea, and tomato sauté full of flavor, color, and wholesome nutrients. And, the antioxidant lycopene in tomatoes is actually more available to our bodies when cooked! Then, the jalapeño beans add a bit of spiciness and satiating protein to the meal. And, you could substitute the farro for quinoa to make this dinner gluten-free! You can freeze this entire meal (or each component separately) for up to 3 months. While ripe jackfruit contains yellow pods that are sweet and fruity, you can cook with young, unripe jackfruit in all sorts of dishes! 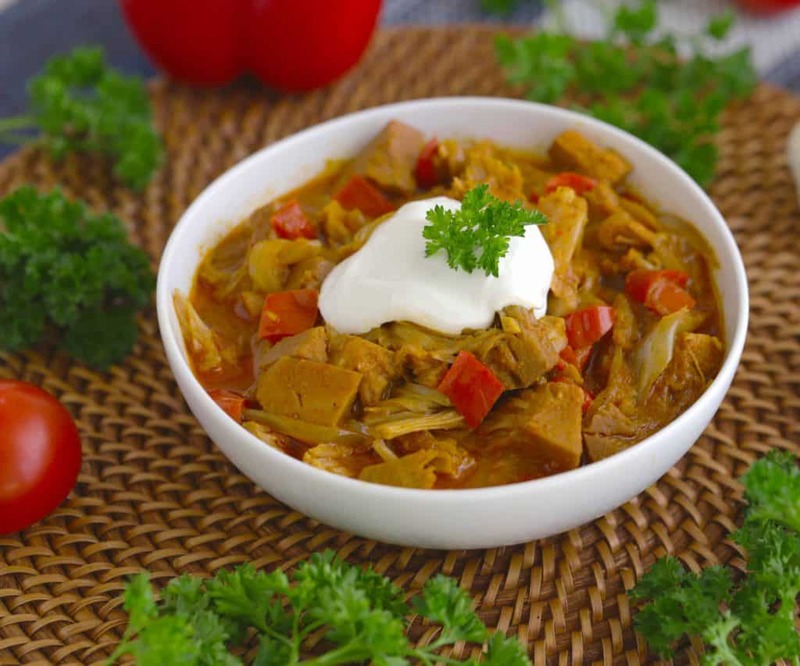 The unripe jackfruit flesh is hearty and actually does resemble the texture of pulled meat. And, its mellow, savory taste makes it the perfect addition to soups or a curry like this because it soaks up all of the flavors! Plus, unripe jackfruit is low in calories and sugar, but LOADED with fiber. If you’re buying them whole, unripe jackfruit are green. But, you may be able to find jackfruit canned in brine and avoid cutting into the behemoth of a fruit! 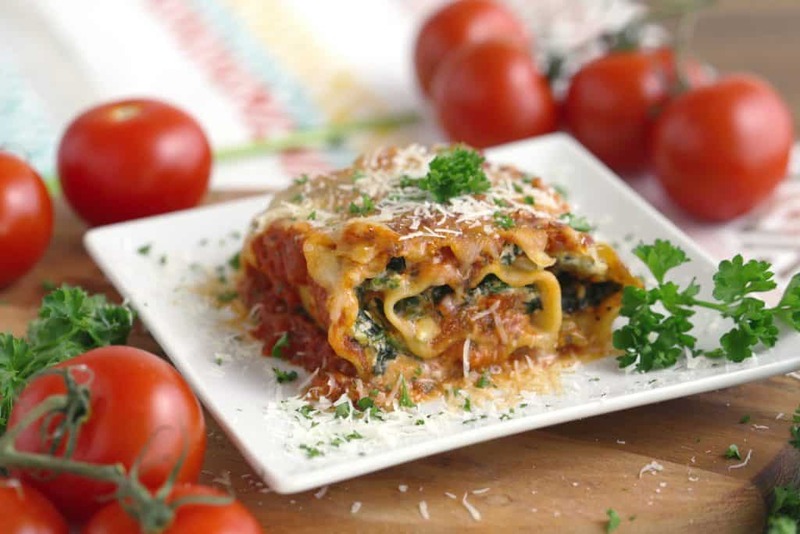 Chow down on delicious layers of lasagna, but cut your prep work in half! Spread your filling ingredients on individual lasagna noodles and roll each of them up. Then, place them in a dish, bake, and you’ve got pre-portioned lasagna servings ready to serve! Or, you can prep your lasagna roll-ups, cover the baking dish, and freeze until you’re ready to bake. You can use whichever lasagna noodles and fillings you prefer, but I recommend whole-wheat lasagna noodles to add extra fuel to the meal. And, fresh spinach works just as well as frozen, but using frozen will save you some money! *Substitute soy sauce with coconut aminos. With a few simple ingredients, you can create big-time deliciousness! In this recipe, the tofu soaks in all of the irresistible umami flavor from the sesame oil and soy sauce. 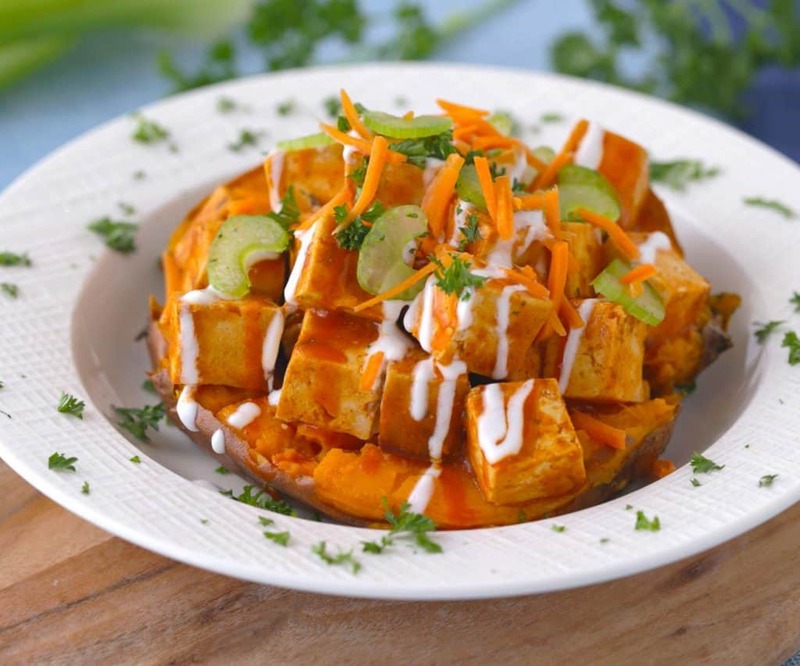 Then, enjoy your Asian-inspired tofu on top of a burrito bowl, on a salad, or in tacos! It’s a super versatile recipe that you can use in different meals throughout the week. Personally, I think the tofu is delicious on top of this herby lemon quinoa! The fresh lemony flavor balances the savory tofu, and you can get creative with other toppings and mix-ins. Plus, pairing tofu with quinoa makes for a seriously protein-packed and fiber-filled meal! Plantains are an excellent source of fiber, vitamin C, and potassium, which helps regulate our heart beat and lower blood pressure. And, plantain chips make an awesome healthy snack! But, many plantain chips (and all sorts of chips) are deep fried in TONS of inflammatory vegetable oils. 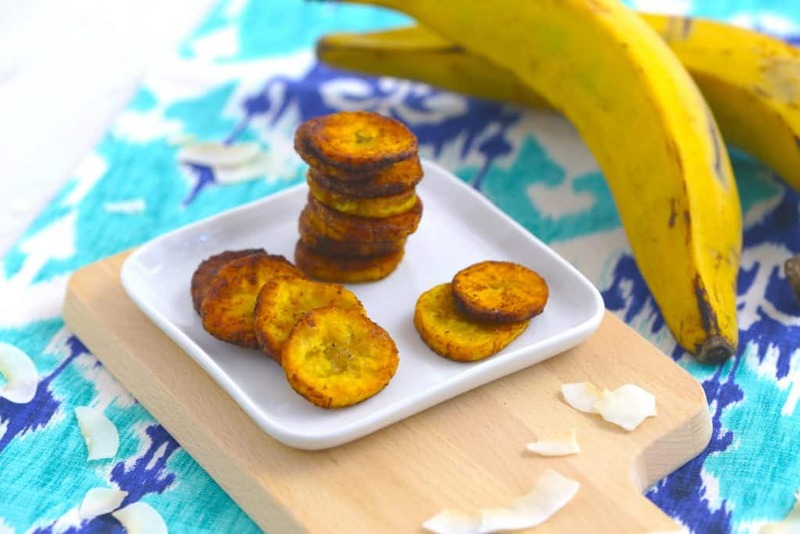 Instead, you can pan-fry your plantain rounds in just a few tablespoons of coconut oil! The turmeric and chili powder give this snack a savory-sweet taste, but you can flavor your plantain chips however you like. You can enjoy them warm or pack them with you for an on-the-go snack! In most hummus recipes, tahini adds the nutty, Mediterranean flavor we know and love. But, if you’re all out of tahini (or don’t want to buy it), you can use PEANUT BUTTER instead! It’s a simple switch, and you’ll hardly taste the difference. And, hummus is a super versatile ingredient that’s good to have on-hand. Use it to add flavor and some protein to all sorts of vegetarian meal prep recipes! 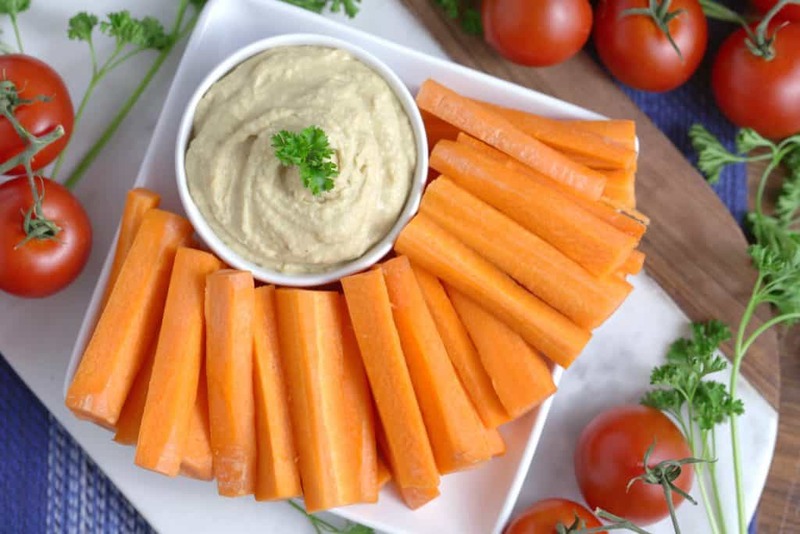 Or, enjoy it as a tasty dip that can help you fit more veggies into your day. Despite popular opinion, starchy potatoes are a perfectly healthy food! They’re full of energizing carbohydrates and they soak in tons of healthy minerals while they’re growing beneath the soil. But, you can lighten up traditional potato pancakes—a.k.a. latkes—with some shredded zucchini! It’s an easy way to sneak in extra veggies, and these beauties are downright delicious. 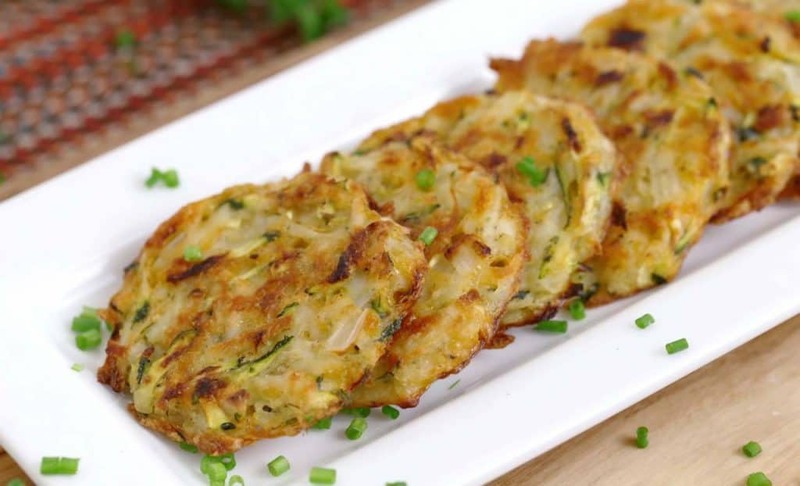 Plus, each latke only contains 20 calories! 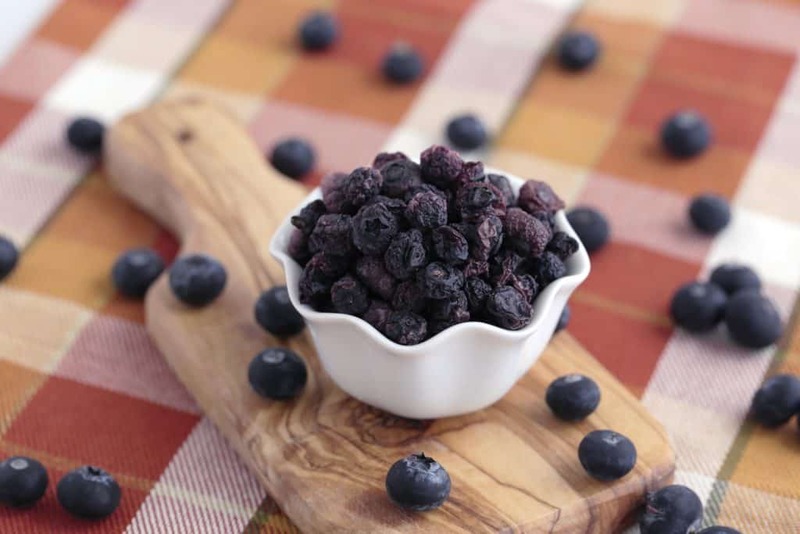 *Choose unsweetened dried fruit, and substitute peanuts with almonds. Don’t believe the health claims on packaged fruit snacks—most of them are sneaky sugar bombs! But, you can make your own dried fruit snacks with NO added sugars or preservatives! You only need 4 simple ingredients to make these chewy, tangy fruit squares. And, there are even some sneaky veggies in this sweet snack! For a Paleo or Whole30 snack, simply switch out the peanuts for almonds. Who doesn’t love a crispy, crunchy chip? 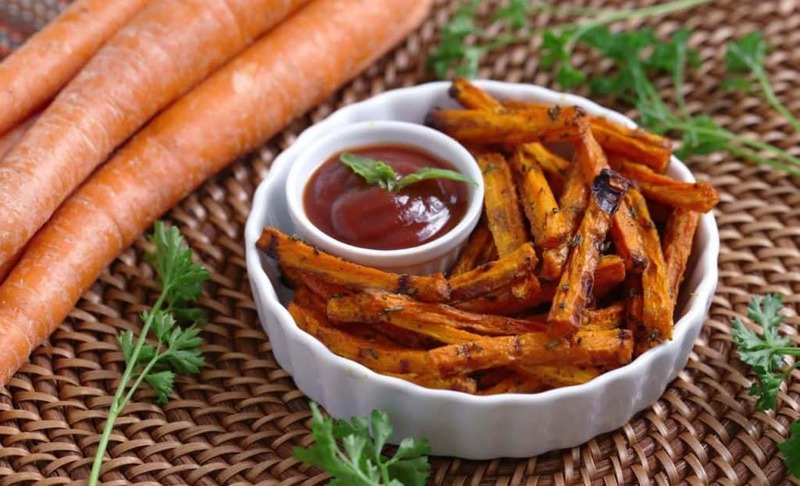 The hearty, fibrous texture of root vegetables makes them perfect for baking into chips! With a mandolin or some careful slicing, you can turn just about any root veggie into tasty chips. Personally, I’m a fan of beets, turnips, and rutabaga! And, because root vegetables grow underground, they soak up tons of nutrients from the soil. 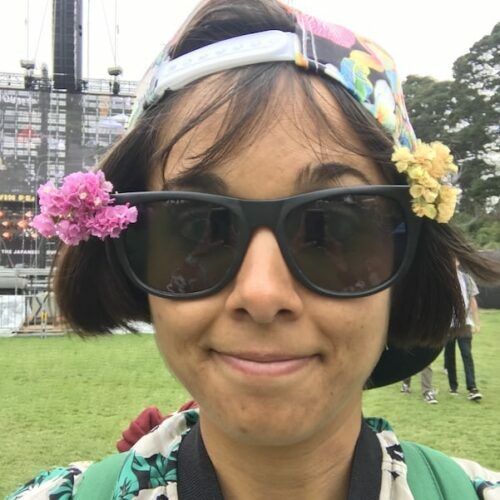 Chips that are crave-ably crunchy AND nutritious?? Yes, please! Here’s a snack that’s so rich, chewy, and indulgent—you won’t believe it’s healthy! Cashew butter is deliciously creamy, and it makes these squares straight-up addicting. Plus, cashews are full of satiating fats and proteins! 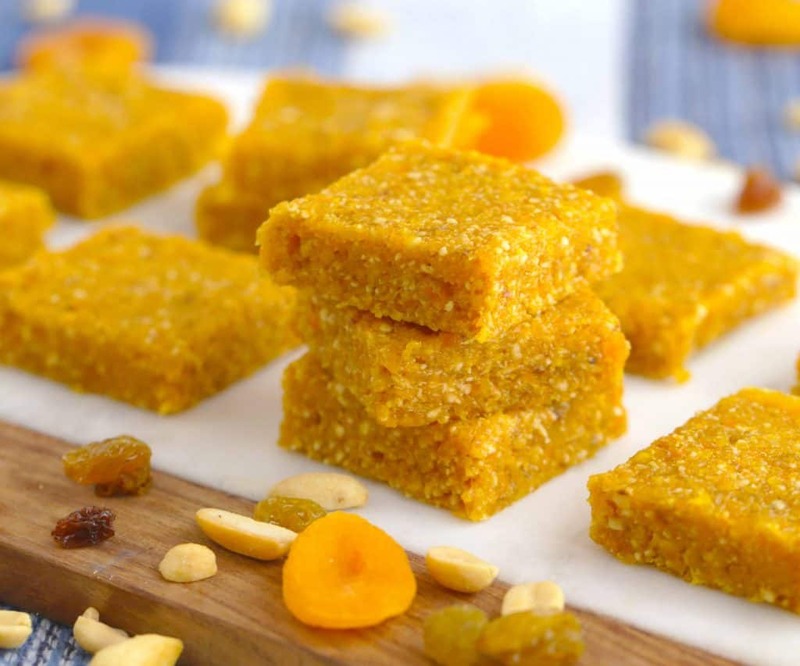 These squares are yummy enough to be a dessert, but wholesome enough to have as a snack. Or even for breakfast! You can use any nut butter you like in this recipe, or sunflower seed butter for a nut-free option. And, in case you’re still not convinced these are worth trying, you only need 3 ingredients to make them! Can fries be healthy? Well, these carrot fries sure are. And, they’ve only got 1 gram of fat per serving! Okay, so technically they’re ‘carrot bakes,’ but they’re tasty in their own right! The sturdy texture of the carrots makes them a great ‘fry’ alternative, with a yummy hint of sweetness. It’s a salty, crispy snack that’s just begging for ketchup! These are delicious freshly-baked, but you can also store these to enjoy throughout the week. Toast them up for warm fries, or I just devour them cold! No room in the oven on meal prep day? No problem. 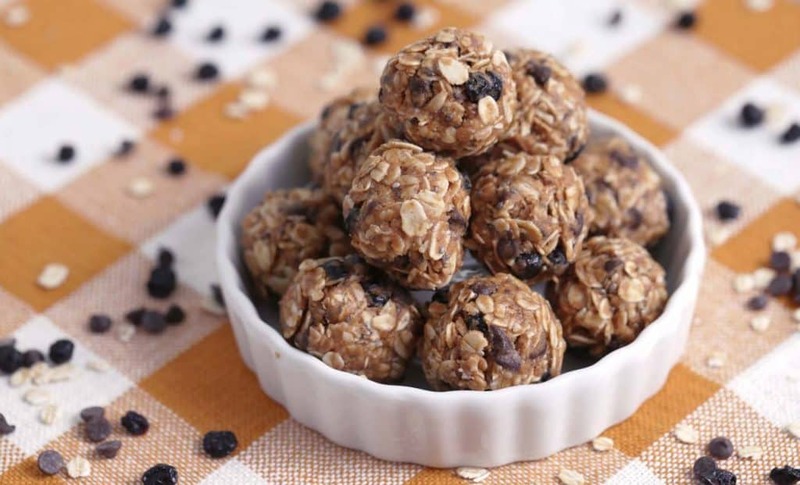 Here’s a no-bake snack that’s loaded up with healthy fuel! (Hence, energy balls.) The slow-digesting carbs in the oats and wholesome fat in peanut butter will help satisfy those post-lunch hunger pangs. Or, feel free to use sunflower seed butter a different nut butter if you like. Plus, you’ll get plenty of fiber and omega-3 fats from the chia seeds in this tasty snack! And, in all seriousness, these are pretty fun to make. 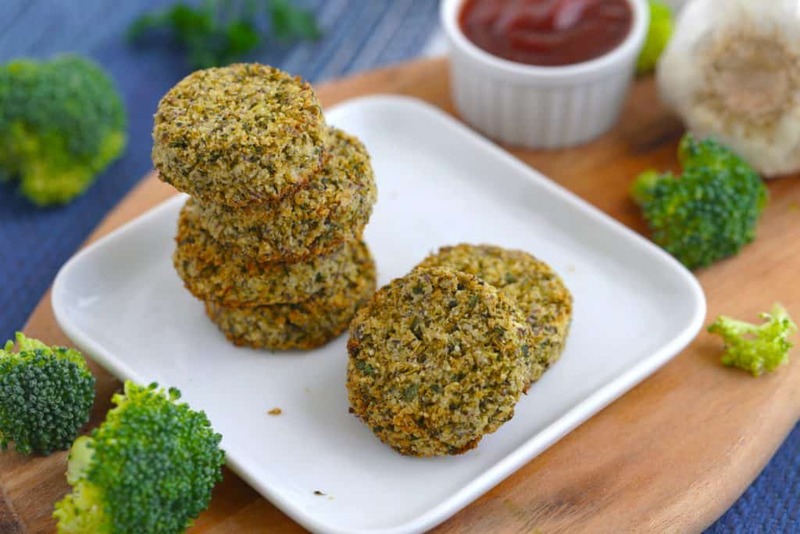 Even though these fritters are baked instead of fried, they’re amazingly crispy! And, the main ingredient in them is BROCCOLI. You won’t believe how good veggies can taste! Enjoy them warm or cold, at any and all times of day. Plus, this healthy snack is totally vegan AND low-carb! Personally, I find that dipping in ketchup takes these little fritters to the next level. But, any dip or no dip will work—they’re still delicious! Store-bought dried fruit and fruit snacks seem healthy, and that’s often how they’re advertised. But, most dried fruit contains a heap of added sugars and preservatives. 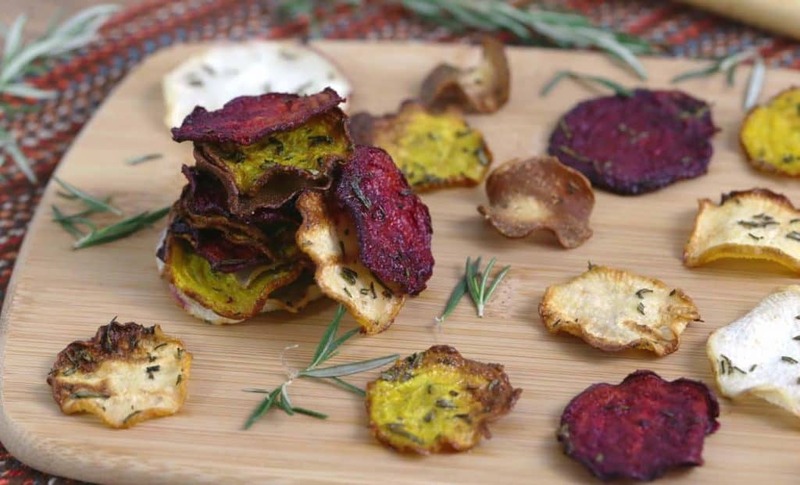 Luckily, it’s SO easy to make your own dried fruit at home! Just pop fresh blueberries in the oven on low heat and let them dry out overnight. They’re a naturally-sweet treat—no need for added sugars! One of the easiest vegetarian meal prep recipes you’ll ever make. Yes, meal prepping requires a bit of time and effort. But, it also can help us save time (and money) by planning ahead and having our meals ready. And, planning those meals is what will keep us on track, rather than ordering a pizza when we’re too tired to cook! Finally—I can’t emphasize this enough—find foods that you enjoy eating, and keep healthy food interesting. Don’t let yourself get bored! With 40 vegetarian meal prep recipes in this article alone (and plenty more all over the internet), the possibilities are endless. 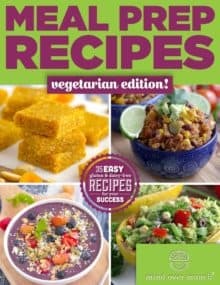 check out out Meal Prep Recipes – Vegetarian Edition eBook! Meal Prep For The Week: Spring Seasonal & Vegan | Vegetarian!